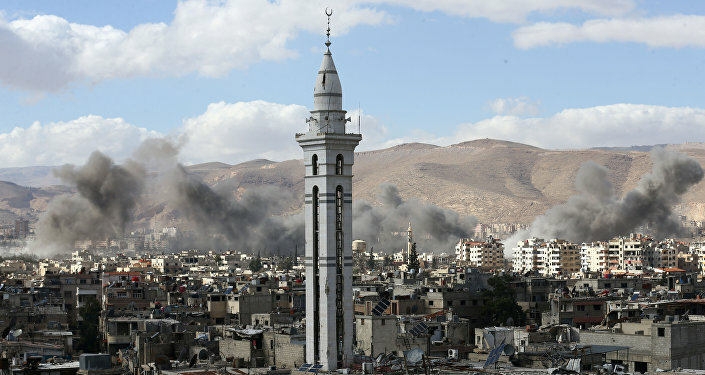 DAMASCUS (Sputnik) - The Syrian troops, who have previously liberated the settlements of Saqba and Kafr Batna, continued the offensive on the town of Ein Tarma, regarded as one of the largest strongholds of terrorists in Eastern Ghouta, a RIA Novosti correspondent reported Tuesday. The Syrian Armed Forces have started the offensive against the fortified positions of the terrorists on the southern outskirts of Ein Tarma. "Our soldiers are now clearing gardens near Ein Tarma. The terrorists offer resistance, firing from mortars and small arms," a Syrian officer told RIA Novosti. The officer added that new units arrived in the afternoon and began to gain a foothold in new positions to give assault squads an opportunity to continue the offensive in the near future. By now, the Syrian army has liberated around 70 percent of Eastern Ghouta. The situation in Eastern Ghouta has been tense over the past weeks resulting in ongoing shelling by local militants on Damascus and fire from the Syrian pro-government forces. Western countries are accusing the Syrian government and Russia of being responsible for the escalation of tensions in the area. Damascus says it opens fire in response to shelling from Eastern Ghouta. On February 24, the UN Security Council unanimously adopted Resolution 2401 that urges all parties to the conflict to immediately stop hostilities and adhere to a long-term humanitarian ceasefire for at least 30 days across the entire Syrian territory in order to ensure the safe and unhindered delivery of humanitarian aid supplies, as well as the medical evacuation of injured people. Despite the adopted document, clashes in the area continued. Soon after the adoption of the UNSC resolution, Russia announced a daily five-hour humanitarian break in hostilities to stop casualties among the population and to let civilians leave Eastern Ghouta.